Pain & Procedural Sedation in Acute Care. Reuben Strayer, Sergey Motov, & Lewis Nelson, eds. The first and most important consideration for successful pain management is an adequate assessment, including an understanding of the cause of pain, prior to selecting interventions. There are two broad classes of pain that are readily distinguished and have markedly different treatment requirements: Nociceptive pain is caused by immediate tissue threat or injury, such as in cancer progression into previously healthy tissue. Somatic nociceptive fibers are highly myelinated, causing rapid transmission of pain impulses with discrete localization of pain. Visceral nociceptive fibers are less myelinated and transmit more diffuse, poorly localized symptoms such as cramping. In visceral abdominal cancers, both systems may be activated–visceral pain from, for example, bowel involvement, and somatic pain from invasion of the parietal pleura. Neuropathic pain, on the other hand, may develop from neurotoxic effects of chemotherapeutics, metabolic microvascular conditions such as diabetes, infectious diseases such as HIV, or direct neoplastic invasion of neural tissue. It may be felt as a numb or tingling sensation, hypersensitivity, or abnormally severe and altered response to minor stimulation known as allodynia. Once the likely cause of pain is determined, its severity should be repeatedly assessed to gauge the adequacy of analgesia and facilitate safe titration to the relief of pain or the development of intolerable adverse effects that limit further dose escalation. A patient’s ability to quantify their distress determines the most appropriate method of assessment; no pain scale has been shown to be superior to others, so the tool most acceptable or applicable to the patient should be used. For some patients able to communicate, a subjective response to adequate or inadequate control may be sufficient. For others, an objective assessment may be more helpful. Commonly used and equally valid pain scales for communicative patients include the Visual Analogue Scale (VAS), the Numerical Rating Scale (NRS), the Wong-Baker FACES scale, and the Verbal Rating Scale (VRS). All of these use the anchors of “no pain” to “worst pain” to help quantify changes. (Jensen 2003) Patients may differ in their response to one scale or another, some being more comfortable with the 0 to 10 NRS, whereas others may only be able to point to one of the FACES expressions, and still others may be limited to only “mild, moderate, or severe.” Whichever is most useful should continue to be used to optimize longitudinal assessment of a patient’s pain trajectory. For patients with severe dementia, non-verbal pain scales may be more useful, such as PAINAD. (Warden 2003) For patients in critical condition, either conscious or unconscious, the Critical Care Pain Observation Tool (CPOT) is well-validated and widely used. (Gelinas 2006) At the end of life, CPOT can be particularly helpful in looking for signs of distress related to pain, and for determining adequacy of response to interventions. Once an appropriate assessment tool is chosen for the patient, whether numeric or descriptive, the same scale should be used among clinicians to assess analgesic effect based on the patient’s response to treatment and the pharmacokinetics of the agent(s) used. Reassessments focus on both analgesic efficacy and adverse effects. The goal is the patient’s report that they are comfortable and do not wish to have more pain medication. For patients only able to use a verbal scale, “better” or “enough” may be sufficient to communicate their level of response. For critical patients, alleviation of non-verbal signs of distress, for example, a CPOT score less than 3, suggests an adequate response. Environmental influences such as excessive light, noise, strong smells, or direct physical manipulation may undermine efforts to provide comfort to the patient and should be controlled to the degree possible. Placing the patient in a quiet room with familiar caregivers and family, turning off or adjusting device alarm settings, and turning monitors to “comfort mode” allow attention to be focused on the patient rather than their evolving physiological decline. Goals specific to palliation should be established and regularly reassessed. For example, if maintaining consciousness is an equal priority to adequate pain control, this requires a different approach than when maximal pain control is paramount. Opioids are considered first line therapy for patients with acute severe pain. The most commonly used parenteral opioids in the acute care setting include morphine, hydromorphone, and fentanyl. The analgesic efficacy of all three drugs is similar when administered in equianalgesic doses; efficacy correlates more with dose and interval than drug choice. For terminally ill patients in pain, analgesic selection is based on palliative goals, altered physiology at the end of life, and, most importantly, the patient’s prior experience with efficacy and adverse effects of the individual agents. Morphine and hydromorphone are often used parenterally at the end of life. Both achieve peak effect in 5-10 minutes when given IV, or 20-30 minutes when given SQ. (Table 1) We recommend reassessment of efficacy and adverse effects every 15 minutes when morphine or hydromorphone is given as an intravenous bolus. For patients with renal or hepatic impairment, lower initial dosing is recommended with extended titration intervals. Morphine is particularly prone to accumulating toxic metabolites in patients with severe renal failure, and alternative agents are favored in this group. For acute care providers, fentanyl has several advantages for managing pain at the end of life. Intravenous fentanyl reaches peak effect in less than five minutes, allowing rapid titration; has minimal renal clearance, making it well suited for patients with kidney failure; and is less likely than commonly used alternatives to cause or worsen hypotension. However, IV fentanyl has a duration of action of only 30-60 minutes, and so is best suited to rapid titration followed by a continuous infusion. As mentioned, fentanyl may also be administered transdermally, intranasally, and by inhalation, as appropriate. Patients may be considered opioid tolerant if in the week prior to presentation they have consistently been exposed to at least 60 mg oral morphine per day (equivalent to 25 mcg transdermal fentanyl/hour, 40 mg oral oxycodone/day, or 8 mg oral hydromorphone/day). All other patients should be considered opioid naïve. For patients near the end of life in a pain crisis who are opioid naive, doses as low as 4 mg IV morphine or 0.5 mg IV hydromorphone with reassessment every 15 minutes may be sufficient. Using rapidly-titrated small doses is more likely to limit side effects, to which the dying patient may be more susceptible, while optimizing efficacy. If, after repeating the dose, pain is still severe (>7/10 NRS) and the patient remains alert and without distressing side effects, the dose may be doubled once and then repeated at this dose, and this rapid-titration process is continued until adequate analgesia is achieved, the patient is no longer alert, or adverse effects such as nausea or delirium supervene. In the majority of patients, adequate analgesia without severe side effects should be achievable within 60 mins. (Harris 2003) If an acceptable effect cannot be achieved with the chosen opioid, switching to an alternative opioid or adding a non-opioid such as ketamine may produce better results. Once the acute pain crisis has been managed and the patient is comfortable, a continuous analgesic infusion may initiated using a 4-hour reassessment of the total dose required to achieve adequate analgesia without significant adverse effects, and dividing that dose into an hourly rate. For example, if 20 mg morphine is required over 4 hours, then the hourly rate would be 5 mg/hour. If the patient is able to use a patient-controlled analgesic (PCA) device, it may be programmed to start the demand dose at 1-3 mg morphine with a lockout of 10-15 minutes and no continuous rate initially if opioid naive. In most patients, self-administering an opioid using these parameters would cause somnolence (and therefore an inability to push the demand button) before overdose complications occur. Patients with sleep apnea or significant lung disease should be started at lower doses with longer lockout intervals, and all patients recently started on continuous or PCA opioid infusions require continued close monitoring for efficacy and adverse effects. (Caraceni 2012) PCAs should only be initiated and titrated by those trained in their use. Patients with end-of-life pain who are on high dose opioids at home and present with severe pain present a particular challenge. For these opioid-tolerant patients, a four-step fentanyl titration can provide rapid control based on prior opioid dosing. (Table 2 and Figure 1) Such assessments and calculations are complicated, and may require the assistance of a physician or pharmacist with expertise in pain management. Step 1: Initial bolus of fentanyl IV, based on 10% of prior 24 hour IV morphine equivalent use. For example, if the patient has taken a total equivalent of 180 mg of oral morphine in the past 24 hours, the IV equivalent would be 1/3 the oral amount or 60 mg IV morphine. 10% of this amount is 6 mg IV morphine, which is equivalent to 60 mcg IV fentanyl. If daily morphine equivalence for an opioid tolerant patient cannot be calculated, fentanyl titration may reasonably be initiated at 25-50 mcg. Step 2: Reassess in 5 minutes. If no severe side effects or excessive somnolence, and patient is still distressed or requesting further analgesia (pain > 4/10), repeat initial dose. Step 3: Reassess in 5 minutes. If no severe side effects or excessive somnolence, and patient is still distressed or requesting further analgesia (pain > 4/10), double the original fentanyl dose. Step 4: Reassess in 5 minutes. If no severe side effects or excessive somnolence, and patient is still distressed or requesting further analgesia (pain > 4/10), repeat step 3 dose. Many patients will achieve adequate analgesia using this 4-step protocol in 30 minutes. (Soares 2003) If ineffective, consider adding a non-opioid adjuvant such as ketamine to augment analgesia. It is recommended to discuss the use of ketamine as an effective analgesic with the patient or family prior to administration, as it may contribute to terminal delirium, and may require combined dosing with benzodiazepines. A variety of non-opioid analgesics may augment (or replace) the efficacy of opioids. Non-steroidal antiinflammatory drugs (NSAIDs) and acetaminophen are useful supplemental analgesics. NSAIDs are particularly effective in visceral inflammatory pain, but require a careful harm:benefit consideration in patients with renal failure or gastrointestinal bleeding. Patients who are suffering from chronic life-threatening illness may also benefit from the use of adjuvant analgesics such as gabapentin or a tricyclic antidepressant for the treatment of neuropathic pain; these agents are poorly studied as therapies for acute pain because of their limited parenteral availability. There are a variety of palliative procedures that may offer significant relief for certain types of terminal pain; for example, bony pain may be best addressed through palliative radiation and visceral pain of cholangiocarcinoma and pancreatic cancer may be very effectively treated by a celiac plexus block. The efficacy of these specialized procedures underscores the benefit of early involvement of pain medicine and palliative care in the management of patients with refractory pain at the end of life. Patients entering an acute care setting in pain at the end of life often are experiencing suffering that may be multifactorial, including physiologic/nociceptive distress, psychosocial distress, and spiritual distress. A careful evaluation of the etiology and characteristics of pain using frequent reassessments of symptoms is the foundation for rapid control. Opioids should be considered first-line therapy for severe pain at the end of life. With careful consideration of the patient’s physiological challenges and the characteristics of available drugs, successful pain control can usually be achieved rapidly and safely. Optimal pain control often requires a multimodal approach with non-opioid adjuvants. When appropriately dosed and targeted therapies have failed to alleviate suffering from refractory pain in the dying patient, palliative sedation may be considered. The editors thank Ashley Shreves, MD and Michael Turchiano, MD for their thoughtful reviews of the manuscript. American Academy of Hospice and Palliative Medicine. Statement on palliative sedation. 2014; http://aahpm.org/positions/palliative-sedation (accessed February 18, 2017). Boyer EW. 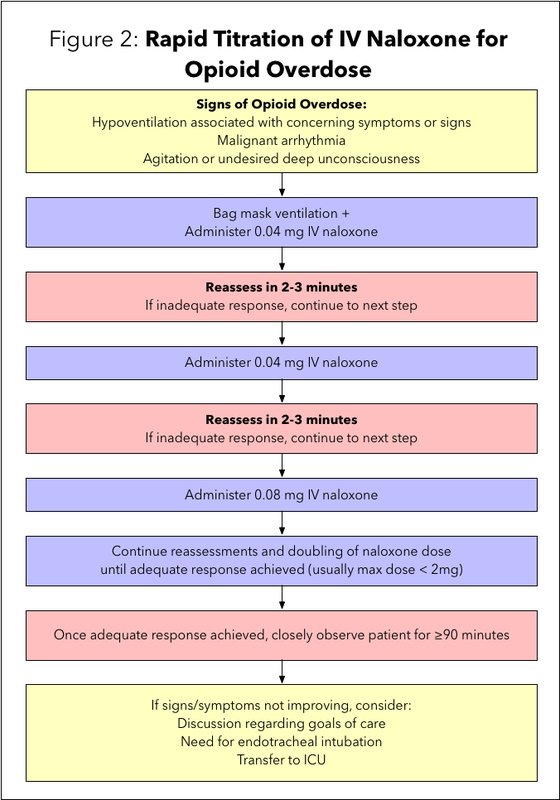 Management of opioid analgesic overdose. NEJM 2012; Jul 12;367(2):146-155. Caraceni A, Hanks G, Kaasa S, et al. Use of opioid analgesics in the treatment of cancer pain: evidence-based recommendations from the EAPC. The Lancet Oncology 2012; 13.2: e58-e68. Cherny NI and Portenoy RK. Sedation in the management of refractory symptoms: guidelines for evaluation and treatment. J Palliat Care. 1994; 10(2):31. Cleeland CS, Gonin R, Hatfield AK, et al. Pain and its treatment in outpatients with metastatic cancer. NEJM 1994; 330(9):592-596. Constantini M, Ripamonti C, Beccaro M, et al. Prevalence, distress, management, and relief of pain during the last 3 months of cancer patients’ life. Results of an Italian mortality follow-back survey. Ann Oncol. 2009;20(4):729-735. Desandre PL, Quest TE. Management of cancer-related pain. Emerg Med Clin Noth Am. 2008 May; 27(20:179-194. Fitzgibbon D, Morgan D, Dockter D, et al. : Initial pharmacokinetic, safety and efficacy evaluation of nasal morphine gluconate for breakthrough pain in cancer patients. Pain 2003, 106: 309– 315. 46. Graham T, Grocott P, Probst S, et al. How are topical opioids used to manage painful cutaneous lesions in palliative care? A critical review. Pain 2013;154(10): 1920-1928. Greco MT, Roberto A, Corli O, et al. Quality of cancer pain management: an update of a systematic review of undertreatment of patients with cancer. J Clin Oncol 2014: 32(36):4149-4154. Grudzen CR, Richardson LD, Hopper SS, et al. Does palliative care have a future in the emergency department? Discussions with attending emergency physicians. J Pain Symptom Manage. 2012;43(1):1-9. Harris JT, Suresh Kumar K, Rajaqopal MR. Intravenous morphine for rapid control of cancer pain. Palliative Medicine 2003; Apr;17(3):248-56. Higginson IJ, Gao W. Opioid prescribing for cancer pain during the last 3 months of life: associated factors and 9-year trends in a nationwide United Kingdom cohort study. J Clin Oncol 2012;30(35):4373-2379. IOM (Institute of Medicine). 2014. Dying in America: Improving quality and honoring individual preferences near the end of life. Washington, DC: The National Academies Press. Jensen MP. The validity and reliability of pain measures in adults with cancer. J Pain 2003;4:2-21. Lamba S, DeSandre PL, Todd KH, et al. Integration of palliative care into emergency medicine: the Improving Palliative Care in Emergency Medicine (IPAL-EM) collaboration. J Emerg Med. 2014;46(2):264–70. Moryl N, Coyle N, Foley KM. Managing an acute pain crisis in a patient with advanced cancer, “this is as much of a crisis as a code.” JAMA 2008. 26;299(12):1457-1467. Pavis H, Wilcock A, Edgecombe J, et al. Pilot study of nasal morphine-chitosan for the relief of breakthrough pain in patients with cancer. J Pain Symptom Manage 2002, 24: 598– 602. Portenoy RK, Sibirceva U, Smout R, et al. Opioid use and survival at the end of life: a survey of a hospice population. J Pain Symptom Manage;32(6): 532-540. Prommer EE. Ketamine for pain: an update of uses in palliative care. J Palliat Med. 2012 Apr;15(4):474-83. Shlamovitz GZ, Elsayem A, Todd KH. Ketamine for palliative sedation in the emergency department. J Emerg Med. 2013 Feb;44(2):355-7. Smith AK, Fisher J, Schonberg, MA, et al. Am I doing the right thing? Provider perspectives on improving palliative care in the emergency department. Ann Emerg Med. 2009;54(1):86-93. 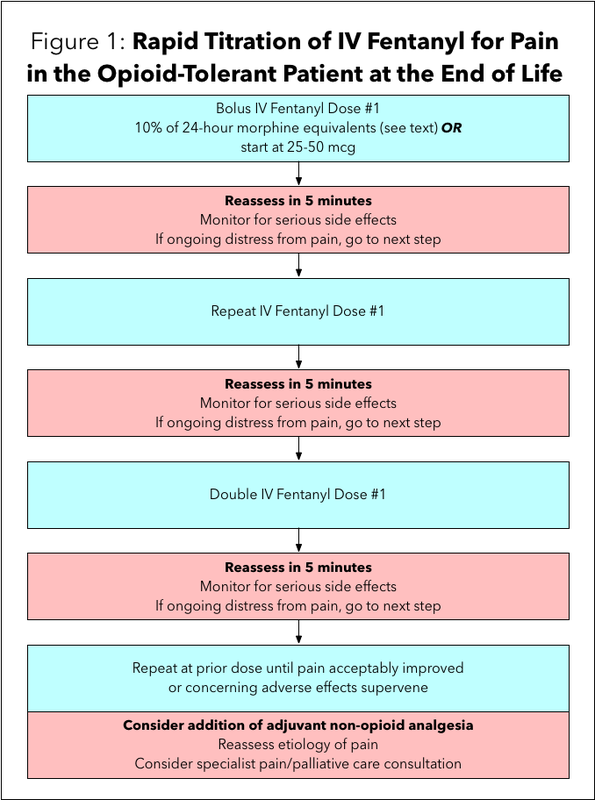 Soares LG, Martins M, Uchoa R. Intravenous fentanyl for cancer pain: a “fast titration” protocol for the emergency room. Journal of Pain and Symptom Management 2003 Sep;26(3):876-881. Steindal S, Bredal L, Sørbye L, et al. Pain control at the end of life: a comparative study of hospitalized cancer and noncancer patients. Scandinavian Journal of Caring Sciences [serial online]. December 2011;25(4):771-779. Warden V, Hurley AC, Volicer L. Development and psychometric evaluation of the Pain Assessment in Advanced Dementia (PAINAD) scale. J Am Med Dir Assoc. 2003 Jan-Feb;4(1):9-15. Winegarden J, Carr DB, Bradshaw YS. Intravenous Ketamine for Rapid Opioid Dose Reduction, Reversal of Opioid-Induced Neurotoxicity, and Pain Control in Terminal Care: Case Report and Literature Review. Pain Med. 2016 Apr;17(4):644-9. Zeppetella G: An assessment of the safety, efficacy, and acceptability of intranasal fentanyl citrate in the management of cancer-related breakthrough pain: a pilot study. J Pain Symptom Manage 2000, 20: 253– 258.